You’re looking over a proposal for your design project. The designer has it all spelled out, but you’re not sure what it all actually means. What is the difference between a concept and a revision? What can you actually expect them to provide at the end of the project? Today I’m decoding some of the lingo involved in the design process to help make this a little clearer. an idea for the direction that a project can go. The designer takes in all of the info about the project, your target market and branding, any budget or production constraints, and comes up with a few concepts that meet all of the requirements, each in their own way. Depending on the type of project, you may be shown anywhere from 2 to 5 or more concepts. These are usually accompanied by a brief statement explaining how the concept addresses all of the points the project is meant to hit. It is customary to choose a single concept (direction) to pursue for the rest of the design process. an updated concept based on requested edits. As much as every designer would love to get a concept 100% perfect out of the gate, usually there are a few edits that need to happen. Perhaps text has changed, or a different photo is needed, or that shade of blue just isn’t quite right. When a client views a concept and provides feedback, the designer will condense that down into edits that need to (or can be) made, and present a revised concept. Professional designers will designate how many rounds of revisions are included in the project fee. a rough or unfinished piece meant to show a concept or revision fully enough for presentation and feedback, without yet being finalized for production or handover. This can take the form of a low-res file digitally (usually a .pdf or other easily viewable file) or an untrimmed sheet from the printing press if you are further along in the process. All concepts and revisions are usually shown in this manner, before a design is finalized. the actual file(s) that the designer delivers at the end of the project. What format those files will take should be spelled out and agreed to in the contract beforehand. Generally designers do not hand over their layered/editable Adobe files, but only work-ready files tailor-made for the use designed for, i.e. files that can be uploaded to the web or given to the printer immediately. For example, if a designer is creating images for social media for you, they will delivered flat, finished image files (.jpg or .png) rather than a Photoshop file. The only standard exception to this is for logo design, when the vector Illustrator file should be provided. If you need access to the Adobe file for your project or a template you can update and use on your own, that should be discussed with your designer up front, before work begins. Did that clear up the parts of the design process for you? What else could use decoding? 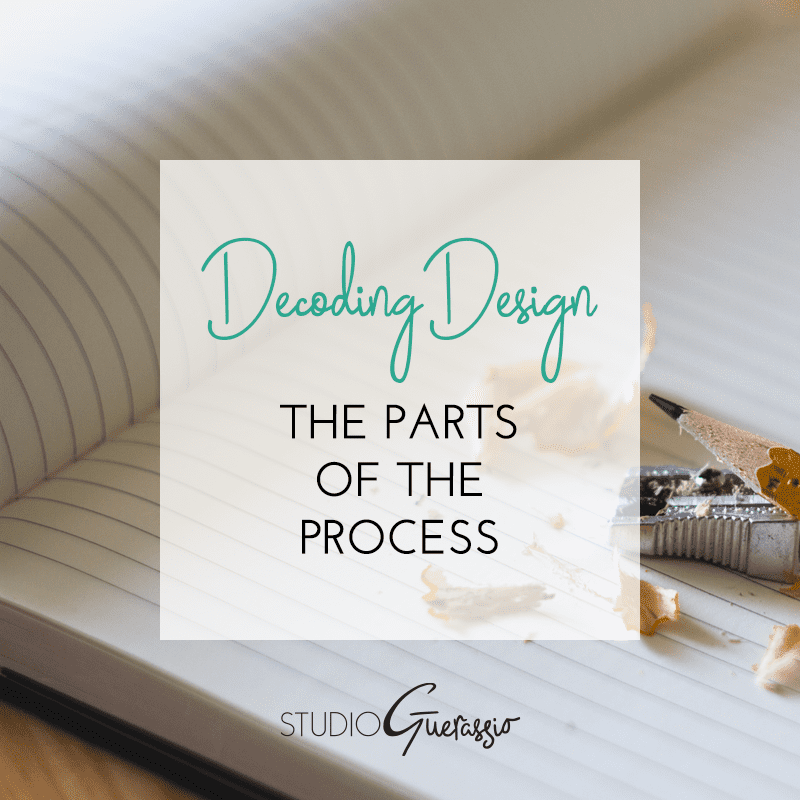 This post is part of my Decoding Design series, where I explain and explore terms and concepts specific to the design world for non-designer clients and readers.